Solid fuel boilers may get overheated during operation, most often due to electricity breakdown. The circulation pump stops, heat from burning fuel is no more removed continuously and the temperature inside the boiler grows rapidly. In such a situation, a temperature-controlled valve that needs no power supply will ensure safe cooling the boiler down. 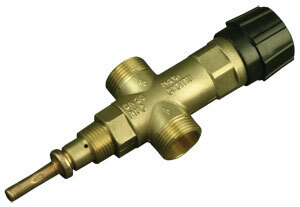 As soon as 90-100 °C are reached, the valve opens and lets cold water from the mains in. 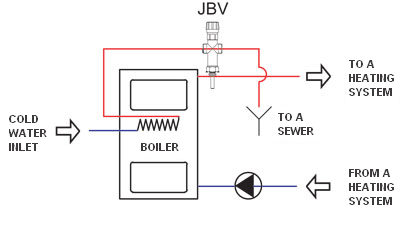 The boiler will be cooled down either via a heat exchanger (JBV valve) or directly (DBV valve). The heated cooling water is then discharged into a sewer. In order to work properly, the valve shall be installed to a place where the highest temperature is reached in case of overheating – usually directly in a top section of the boiler or on an outlet pipe close to the boiler. 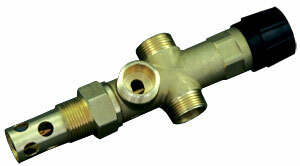 The valves are fitted with a thermostatic element from a renowned French manufacturer. Since the thermostatic element is located directly in the valve body, its reaction to water temperature fluctuations is immediate. 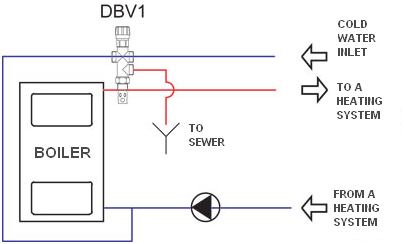 The valve has no capillary that could be damaged during installation. The valves are 100% tested in the production. G3/4″ threaded connection with a protective cover for the thermostatic element. Mostly used for boilers with a built-in recooling heat exchanger, or with an external recooling heat exchanger. G1/2″ threaded connection without a protective cover for the thermostatic element. A model with G3/4″ threaded connection and a protective cover for the thermostatic element is available upon special request.